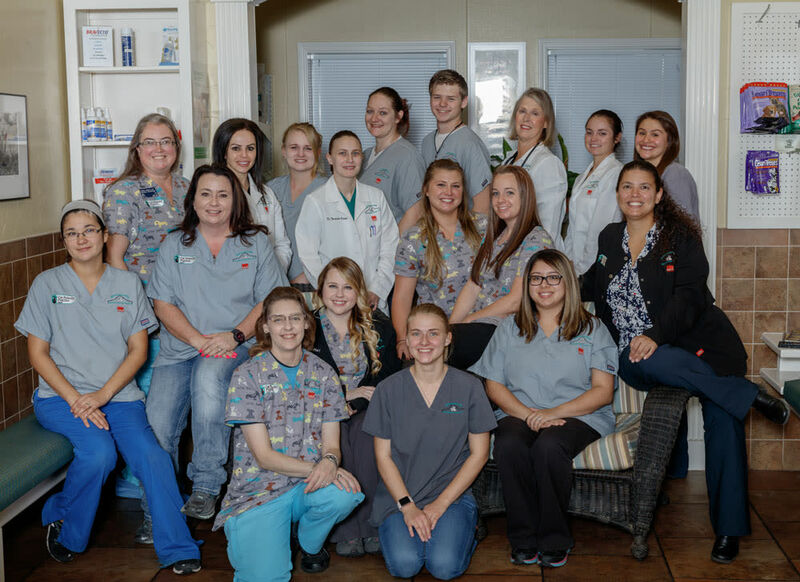 Grandview Veterinary Clinic’s experienced support staff strives to provide personalized, compassionate care for our patients and clients alike. 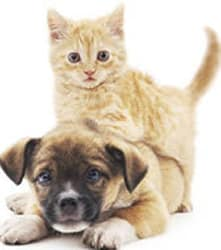 When your pet needs care, we’re here to help. 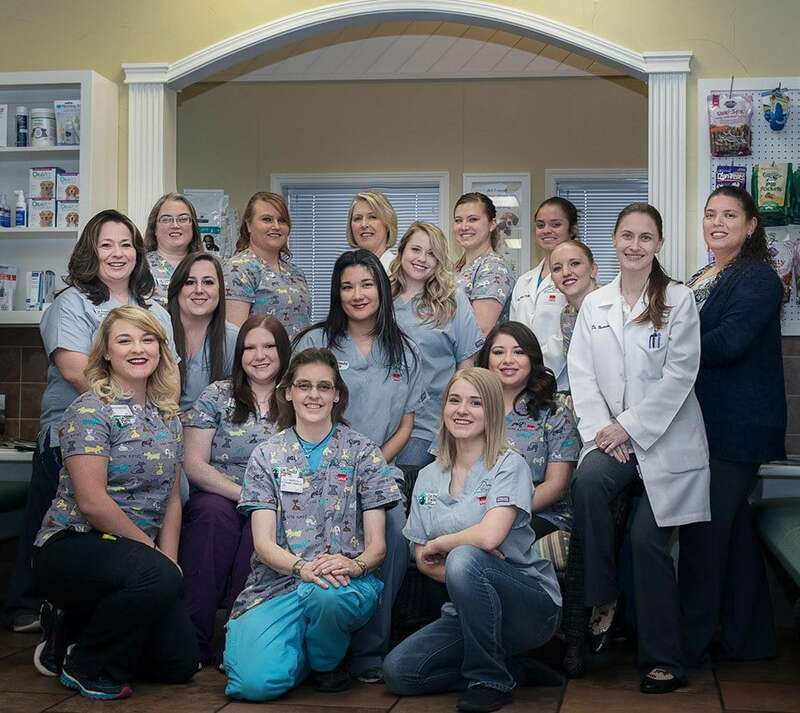 Grandview Veterinary Clinic is staffed by a team of nurturing professionals, committed to the health and wellness of animals in Odessa. We are dedicated providers of wellness care, preventative medicine, internal medicine, and more. Olive the Snow Shoe cat lives here at Grandview Veterinary Clinic and has been affectionately endeared as “The Clinic Cat.” However, we all know she is quite the assistant manager, helping to pay bills by laying on them. She is a “little old lady” now at 17 years of age (although she acts like a mere 14-year-old), and happily spends the days of her retirement trotting around the clinic in her spunky manner, managing affairs, and snoozing in a warm bed wherever she finds one. Before her retirement, she generously donated blood upon occasion to any feline patient in need of a blood transfusion; so many lives are attributed to her willingness to lend a paw. Everybody who meets Olive loves her and her little furry purr. She always appreciates a nice chin scratch or rub, and she will sneak up behind you to rub against your leg to return her love. 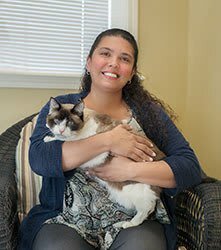 For the past 25 years, Michelle has worked as a veterinary technician with her major professional interest being focused on Internal Medicine. Since 2005, Michelle has served in a management role of a 20 doctor emergency & specialty practice and before that as a manager of the NYC animal control shelter system. She is passionate about client and staff education, in addition to authoring a variety of educational lectures, Michelle has been a presenter at the DC Academy of Veterinary Technicians. 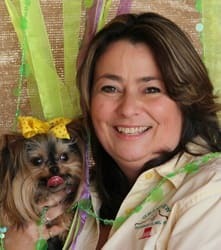 Michelle has also served on the Board of Directors for local Humane Societies, canine and equine rescue groups. Michelle is an avid cat and dog lover, sharing her home with American Pit Bull Terriers, American Quarter Horses, and chickens. Jackie came to us from California in January 2015. She moved to Odessa after her husband, Trevor, who is originally from Odessa, got out of the Marine Corps after serving 4 1/2 years. Trevor now is a firefighter for the City of Odessa. 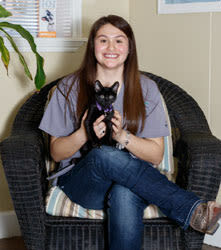 Jackie has been working as a receptionist and assistant in the Veterinary field for over 10 years. She shares her home with a psychotic Blue Heeler named Gunny, whom she rescued in 2016. Alongside his hyperactivity, he has every health problem known to man, but still gets all the love and attention he deserves! 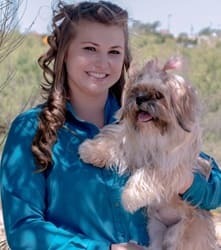 Jackie enjoys building relationships with our clients and their pets, and we are happy to have her on our team. 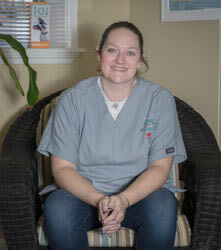 Darla originally started with Dr. Myers in 2000. She left us for a short while, but decided she needed to come home. We are extremely pleased to have her back. You will find Darla behind the reception desk for us. 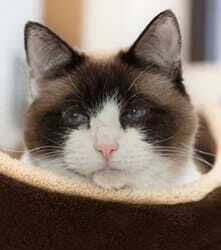 She is absolutely wonderful with the clients as well as the pets. If we could clone her, we certainly would! Even though her official title is receptionist, don't be surprised to see her anywhere in the clinic, this employee can do it ALL! Darla has two boys, Nathan and Nicholas, and of course, there is a fur baby named Cupcake. Ashley comes to us from Lovington, New Mexico. She has lived in Odessa for 7 years with her husband Bobby and their handsome 5-year-old son Bryson. Aside from family time, she has always had a passion for animals. Ashley has 5 dogs at home that keep her busy and are all valued members of her family. She is planning to start school to become an LVT, so she can make her career in Veterinary Medicine. 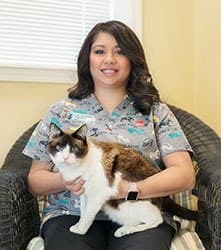 Daniella graduated with an Associates Degree in Veterinary Technology in 2008, and after passing her state and national examination, started working as a Licensed Veterinary Technician in 2009. She has been in the veterinary field since 2006. Daniella is currently working on her Veterinary Technician Specialist Degree in Nutrition. She has a wonderful husband who is very supportive of her career. Together, they have a farm that is a home to dogs, cats, horses, chickens, turkeys, goats, pigs, and an awesome donkey. We are very thankful to have her experience and expertise here at Grandview! Molly moved to Texas from Prescott Arizona. She has always loved all kinds of animals, especially large and giant breeds. 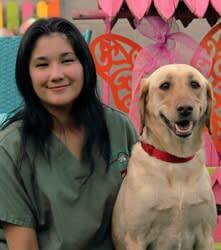 She is interested in progressing her career in veterinary medicine. In her free time, she enjoys reading, bowling, and watching movies. She is happily married and 4 dogs at home. Bianca was born and raised in Odessa. She has a passion for both animals and kids. She has been exposed to cats and dogs throughout her entire life. Bianca has two dogs, Max and Duke, that she has had since she was 9 years old. We are excited to have Bianca’s upbeat personality here at Grandview. Amanda has recently moved to Texas from Indiana. She has graduated from Vet Tech Institute in Indianapolis with an Associates Degree in Veterinary Technology in 2016. She is a Registered Vet Tech in Indiana and is pursuing to get Licensed in Texas. She has always had a passion animals. She adopted her dog, Opie, in 2014 and they have been best friends ever since. In her free time, she likes to crochet, watch classic TV shows, spend time with family and travel.